Eldridge’s comments were apparently aimed at residents engaged in demonstrations against the unpopular Futenma Marine Corps base in the city of Ginowan. Channel Sakura, which styles itself a Japanese culture channel, is widely known for its glorification of Japan’s role in World War II and for airing shows that deny the Japanese military forced Korean women into sexual slavery. In 2007, its founder, Satoru Mizushima, directed the movie “The Truth About Nanjing,” which labeled the 1937-38 massacre — in which, according to mainstream historians, tens of thousands of Chinese were killed — a fabrication. Eldridge also appeared on Channel Sakura last September. The U.S. Embassy referred requests for comment to U.S. Forces Japan. At the time of publication, neither USFJ nor Eldridge had responded to requests to confirm who had authorized the appearance on the TV network. 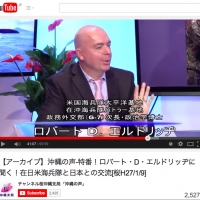 Manabu Sato, a professor in political science at Okinawa International University, criticized Eldridge’s comments. 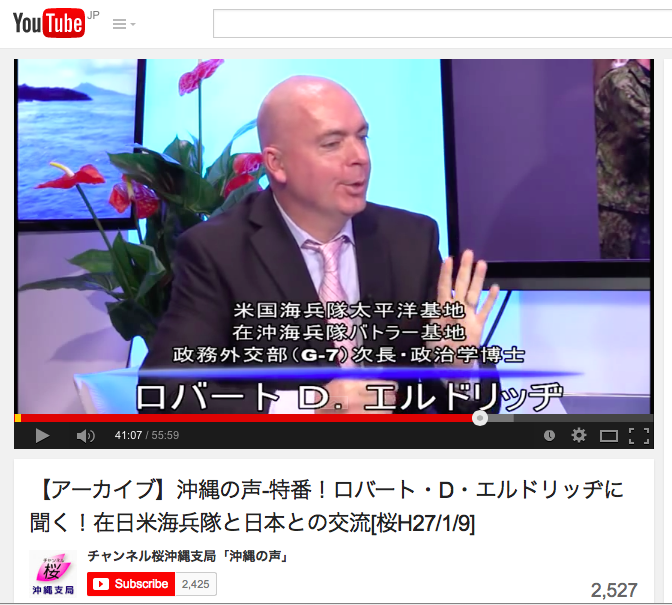 Eldridge’s accusations of hate speech are the latest in a recent string of gaffes from senior officials affiliated with the U.S. military in Okinawa. On Feb. 9, The Japan Times reported comments by Capt. Caleb Eames, deputy public affairs officer for the Marine Corps Installations Pacific, in which he accused demonstrators in Okinawa of faking their injuries in clashes with the police and Japan Coast Guard. Eames later asserted that the comments were not an official statement. Meanwhile, on Feb. 13, Japanese media reported that Maj. Tim Kao, the commander of Camp Gonsalves in northern Okinawa, had accused demonstrators in Okinawa of being “paid by the Communist Party.” The comments, which were apparently made on Feb. 5 to a visiting research student, angered local residents who have been attempting to block construction of Pentagon helipads in their community since 2007. At a news conference Friday, Okinawa Gov. Takeshi Onaga expressed his indignation at the comments by U.S. military officials. “They are very far from being good neighbors. I have serious doubts about what is at the root of such thinking,” he said.